Speaking at the opening of Bankers' Week yesterday, Minister of Financial Services Ryan Pinder urged businesses to offer internships and to get involved in innovative training programmes. 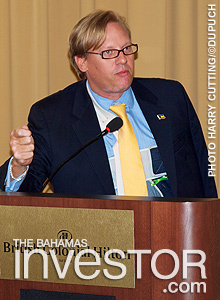 It is vital that The Bahamas’ financial services industry exploits and encourages local talent as the global environment becomes more challenging, according to Minister of Financial Services Ryan Pinder (pictured). The Minister praised the work of the Bahamas Institute of Financial Services (BIFS) in encouraging high school students to consider a career in the industry through its Grade 12 Financial Services Certificate programme. He also said his Ministry would reward those companies with innovative training programmes and urged businesses to get involved by offering internships to the younger generation. In particular, Pinder emphasized the need to encourage greater fluency in foreign languages as The Bahamas reaches out to emerging markets such as Brazil. He said his Ministry’s 10-year plan for the sector included the expansion of foreign language and cultural sensitivity programmes and languages offered would include Spanish, Portugese, French, German, Arabic and Mandarin. This focus on new markets would help The Bahamas grasp unexplored opportunities and enhance its competitiveness, the Minister said. Bankers’ Week is a three-day series of seminars and presentations organized by the BIFS. It runs until Thursday and is being held at the British Colonial Hilton, Nassau. Additional speakers at yesterday’s opening event included director of trade in the Ministry of Financial Services Viana Gardiner and Lawrence Lewis, senior partner at Deloitte. The Securities Commission of The Bahamas (SCB) has announced the appointment of Velma Miller as the manager of its Market Surveillance Department, effective May 13, 2013. The government is adjusting its legal framework and improving market access in order to build better trade links and satisfy the requirements of the World Trade Organization, which it hopes to join by the end of 2014.